1. 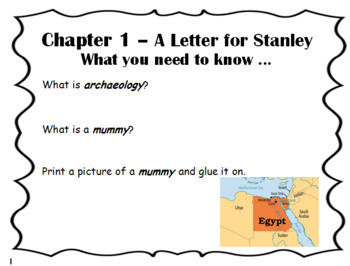 Background building pages to be done prior to reading the book that will have your students researching information to learn about the continent and country Flat Stanley is visiting. 2. 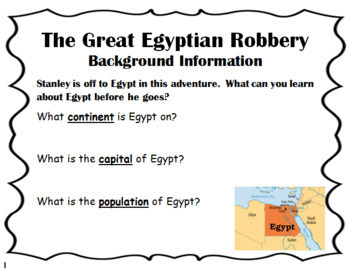 A page or two of research questions to build the background knowledge your students will need to be successful with the chapter to be done prior to reading the chapter. 3. A guided reading page for each chapter that will set the focus for reading with a brief introduction to the chapter and then 1-3 focus questions to be reading to answer when done with the chapter. The background building pages are designated in the packet with a map of where Flat Stanley is located. 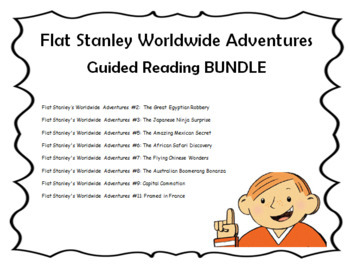 The guided reading pages are designated with a picture of Flat Stanley on them.